Sangria is the typical summer drink enjoyed on gorgeous Spanish beaches and around the world. A delicious blend of wine and citrus. This sangria can be enjoyed with friends for a party or as an everyday aperitif. Just pour it into a jug full of ice cubes, garnish with your favorite fresh fruit and enjoy. 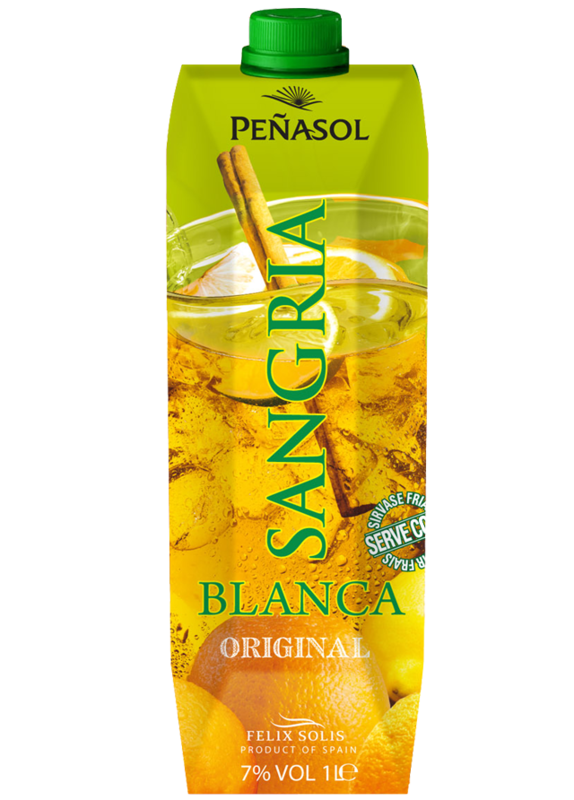 Simply delicious and refreshing drink with a great tradition, this white sangria is filled with aromas of fresh citrus fruits and peaches. A tasty entry leads to a fruity medium body of peaches, passion fruit and orange zest flavors with a crisp, revitalizing finish. A flashy Sangria that is sure to light up any occasion! Pairs nicely with barbeque, pizza, and your grilled favorites or enjoy over ice with a fresh slice of orange. Chilled with ice cubes and slices of lemon, orange, strawberries or apple to bring an additional zing! It also tastes great mixed with tonic water or lemonade. Sangria undergoes a process of pasteurization, which preserves the qualities of colour, aroma and flavour.